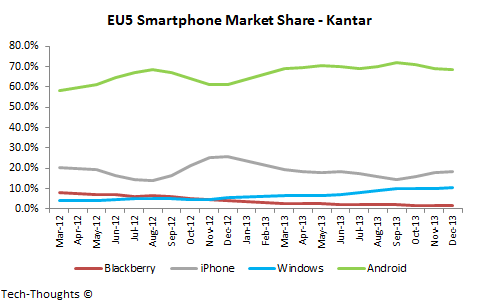 It's time again for my quarterly recap of smartphone market share figures from Gartner and Kantar. For those who missed it, here's the Q3 recap. In Q4, Android continued to dominate the charts, while the iPhone saw a lower than expected seasonal bump. And as I expected, Windows Phone's recent growth seems to have stalled. 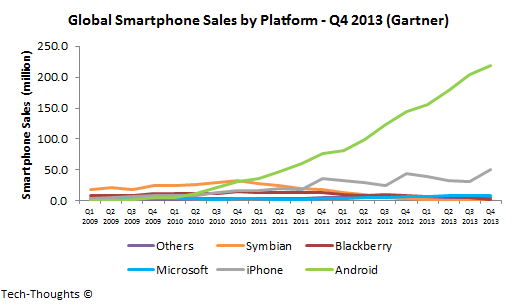 The chart above shows Gartner's estimates for end user smartphone sales in Q4 2013. Android smartphones were responsible for roughly 220 million or about 78% of the 280 million smartphones sold in the quarter. The iPhone held just under 18% of the market, a seasonal jump from 12% last quarter, but a YoY decline from 21% in Q4 2012. Windows Phone's recent growth spurt came to an end as its share of the market dropped to 3%, from nearly 3.6% in Q3. This shouldn't be surprising, as the contribution margin of Nokia's smartphone division has been negative ever since the shift to Windows Phone. A hardware company cannot consistently subsidize sales unless they have an alternative business model in place. Microsoft may attempt to do so, but will face an uphill battle without Nokia's brand. The US has traditionally been the strongest market for the iPhone because of the subsidized pricing model followed by carriers. However, T-Mobile and AT&T's move to unsubsidized plans seems to have had a significant impact. In Q4, Apple's share of the US smartphone market fell below levels seen during 2011, i.e. during the iPhone 4S launch. Android became the primary beneficiary as the new pricing plans introduced price sensitivity to the US market. The UK has traditionally been one of the iPhone's strongest markets outside the US, which resulted in significant seasonality in smartphone sales. However, this year's the iPhone 5S launch seemed different from previous launches. Android maintained its market share, while the iPhone saw a resulting in a YoY decline. Windows Phone, which had seen strong growth over the past year, also saw sales growth stall. As we saw in the UK, the iPhone 5S launch failed to generate the excitement of previous launches. As a result, the seasonal peak in the iPhone's market share (~17%) was lower than in the last two years. 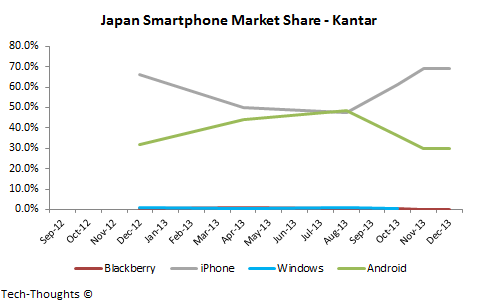 Android held a 75% share in the smartphone market, while Windows Phone saw an end to its brief uptick in sales. 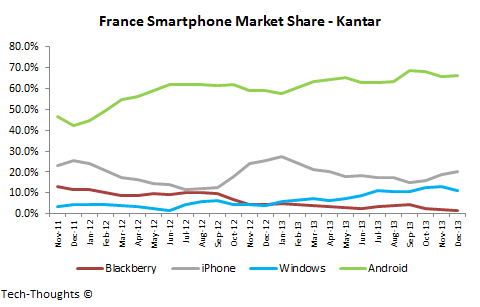 Smartphone market share patterns in France nearly mirrored those seen in Germany. With the iPhone's forgettable holiday quarter, Android maintained its dominance. 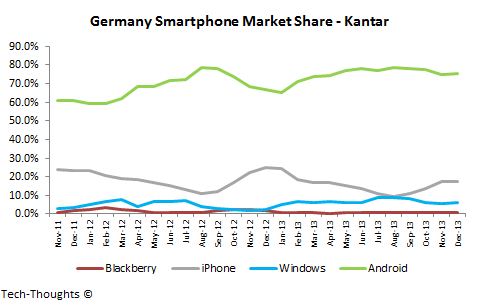 At the same time, Windows Phone's market share seems to have peaked at ~13% in November. Italy seems to be the only market where Windows Phone remains relevant as it saw strong MoM gains to become the second largest platform. As in other countries, the iPhone 5S launch only precipitated a drop in market share to pre-2011 levels. 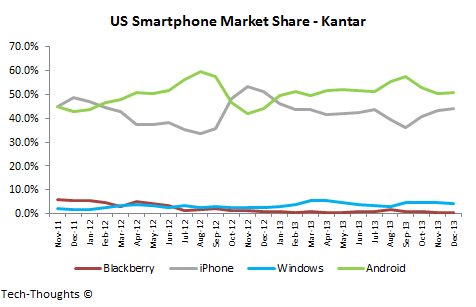 While Android continues to lead, it has lost share to Windows Phone over the past few months. 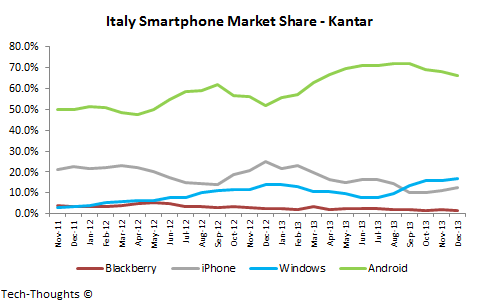 I suspect that Windows Phone's performance in Italy is related to the strength of the Nokia brand. Once the Microsoft acquisition closes (and Nokia's brand is delinked from Windows Phone), we should have a better understanding of the drivers. 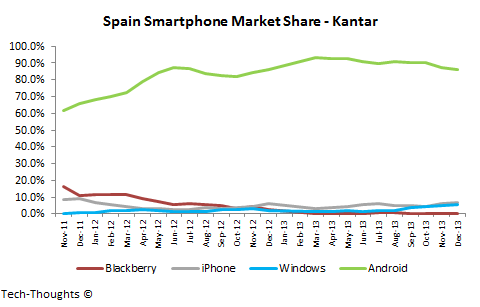 Spain has been been dominated by Android over the past year. While the platform's market share is down to 86% from the 90% levels seen earlier in 2013, neither the iPhone nor Windows Phone seem to have achieved nearly enough scale to mount a challenge. As we've seen above, the pattern across EU5 nations has remained remarkably stable. The iPhone 5S launch did not create the usual sales spike and resulted in YoY declines across all countries. At the same time, Windows Phone's growth has come to an end, although it hasn't yet begun to decline (thanks to Italy). 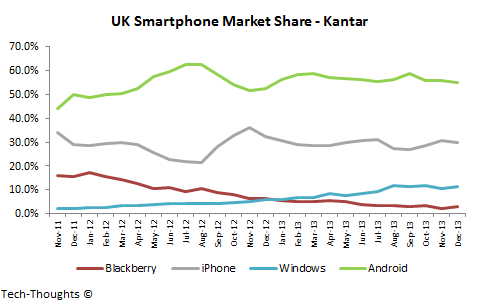 As a result, Android maintained its dominance, holding a ~70% share of the market. 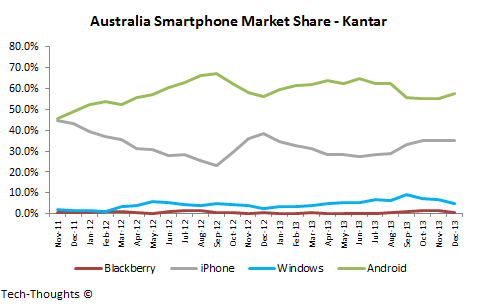 Australia has traditionally been a very strong market for the iPhone. However, this holiday season, the iPhone saw a YoY decline in market share as Android made gains. Windows Phone's recent growth seems to have ended as well. Japan seems to be the last remaining stronghold for the iPhone as it consolidated its position with the addition of NTT DoCoMo. Japanese carriers follow an opaque pricing model very similar to the one we saw in the US. As a result, the iPhone holds a dominating position with ~70% market share. Android (or AOSP in this case) held a ~80% share of smartphone sales over the past few months. According to Canalys' Q4 estimates, Xiaomi's 7.3 million smartphone shipments overtook the iPhone's 7 million. 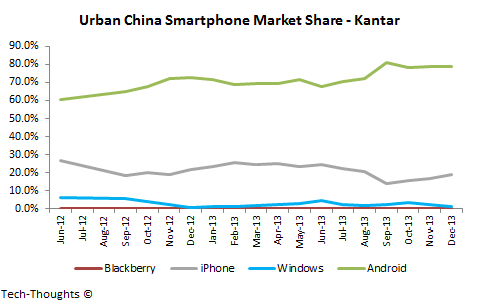 That's a significant shift given that it coincided with the iPhone 5S launch in China. 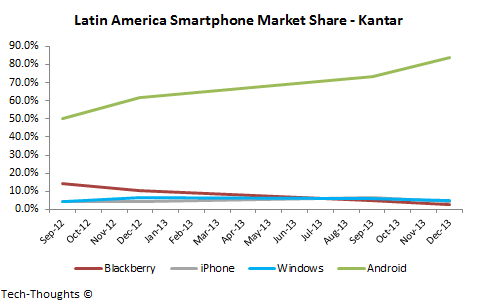 Latin America, including Mexico, Brazil and Argentina, saw Android's share of smartphone shipments grow to more than 80%. Despite the price sensitivity of these markets, Windows Phone held less than 5% of the market, just above the iPhone's 4%.